Your mother can speak on just about any subject. Family issues, money, old music, new technology, cooking, fashion, she’ll teach you all day. 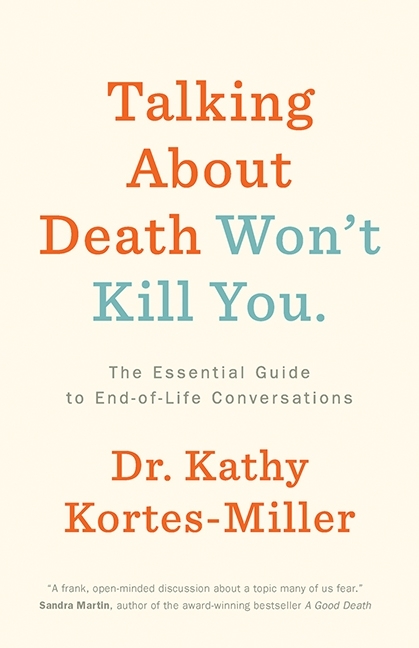 Ask her about one certain topic, though, and her lips are sealed tight but with “Talking About Death Won’t Kill You” by Dr. Kathy Kortes-Miller, you can school Mom on a thing or two. One year prior to her second go-around for a PhD program, Kathy Kortes-Miller received a diagnosis of cancer, which altered her life and her career path. Naturally, she was fearful. She said aloud that she didn’t want to die, and her statement was brushed aside. Nobody would even discuss death, she says, and though she obviously lived, she wishes today that someone had taken time to talk to her about her fears and the outcome she might’ve had. “Death education,” as she calls it, should never be ignored. We spend years getting an education, we spend months researching a car or a new home, but we spend very little time learning to die – and that’s unfortunate. Dying, she believes, is actually an important part of living, which is why you should have That Conversation. “Dying matters,” Kortes-Miller says, and until a few decades ago, that was a given; people were much more comfortable with death and the things attached to it. Death was a social event, as it is today, but it seems now as though we’re afraid to have a discussion about it, lest we invite it. The important thing is, everybody dies sometime so we may as well get comfortable with that. When having That Conversation, gently tease out whatever fears remain, and face them by becoming “death literate.” Talk about “advance care planning” and the legacy you want. Know that family relations are complicated and that a proxy may absolutely be necessary. Write down everything you want health-care providers to know. Don’t be afraid to involve children and don’t use euphemisms. And finally, new technology gives a twist to something as old as life itself. Know how to use it right. You don’t have to be elderly to get a lot out of “Talking About Death Won’t Kill You.” You don’t even have to be dying to read this book. Even if you’re hale and in the bloom of life, Dr. Kathy Kortes-Miller has plenty to teach you, including questions you can ask to dig deep into your own feelings on end-of-life matters, and a matter-of-fact passage on what happens when we pass. But this book isn’t only for consumers: physicians and health-care workers are given attention here, too, because Kortes-Miller indicates a not-always-fulfilled need for That Conversation in hospitals and hospice situations. There are chapters here for parents and for caregivers, for adult children, for CEOs, and for work-buddies. On the latter, Kortes-Miller helps employers to create a better, more compassionate workplace. This book probably isn’t anybody’s idea of a beach read, so grab it and grab opportunities for That Conversation. “Talking About Death Won’t Kill You” and, of course, neither will reading about it.